William S. Phillips Handsigned and Numbered Personal Commission® Print Countersigned by the Surviving Doolittle Raiders :"Toward the Setting Sun"
Edition: Artist Signed and Numbered, Time Limited. 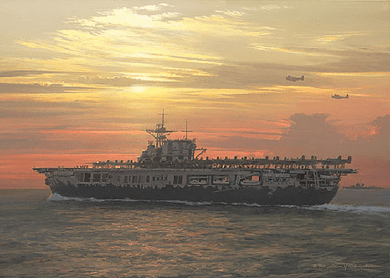 Artist William S. Phillips and The Greenwich Workshop bring you the first opportunity to personally commission and own a piece of Doolittle Raider history. The historical significance of the daring raid on Japan will never change. This is your chance to possess a work of art authenticated by the actual Doolittle Raiders. 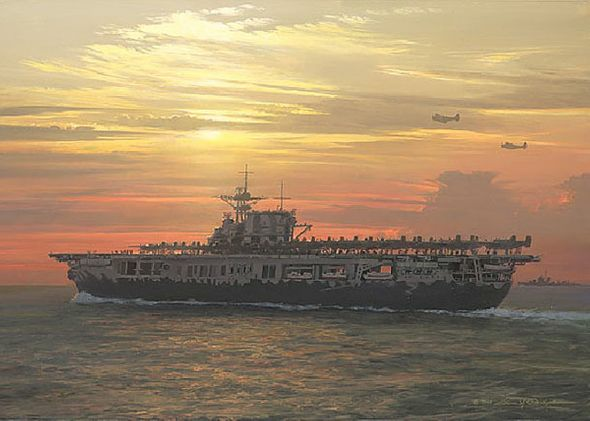 Toward the Setting Sun features the USS Hornet (CV-8) with the Doolittle Raiders' 16 B-25s lashed down across her deck as she steams majestically into a Pacific sunset. SBDs of the USS Enterprise's (CV-6) Scouting Squadron 6 (VS-6) patrol the skies above. At the time, the mission was referred to as the Halsey-Doolittle Raid; and here Phillips pays homage to the Navy's significant role. Sending two United States aircraft carriers, Task Force 16, to the coast of the Rising Sun in 1942 was a courageous and risky move; especially for a nation reeling from Japan's string of Pacific victories. Most of the ships and sailors that made up Vice Admiral Halsey's TF 16 would six weeks later deal a staggering blow to the Japanese Fleet off Midway. The Halsey-Doolittle Raid truly marked when the Rising Sun began to set. About the Art: Now is the time to commission your print to be countersigned by the surviving members of Doolittle's Raiders attending the 68th Reunion at Wright Patterson AFB in Dayton, Ohio, April 16-18. With this, the sixth release of artist William S. Phillips' series on the Doolittle Raiders, the artist and the surviving members of the Raid pay homage the Navy's role in the legendary raid on Japan. Sending two United States aircraft carriers to the coast of Japan in 1942 was a risk of the highest order for a fleet, and a nation, still reeling from Japan's string of victories in the Pacific. The USS Hornet, loaded with the 16 B-25s (all that could be shipped) which would strike the Japanese mainland in the "Halsey-Doolittle Raid," steams westward as part of Vice Admiral Halsey's Task Force 16. The SBD Scout Bombers circling above would have been members of VS-6 flying from the USS Enterprise.